Although, I'm not sure I'm ready for winter and I hope 4 sweatshirts and a Jacket are enough. I am still happy fall is here, last year I enjoyed Fall in Korea by traveling on an awesome weather (except for those windy days in Jeju-do). We are planning on a little gathering on saturday at our rooftop^^ and apparently thursday is Girls night out! Is there anyone there?, wow, how long have I been gone from the bloggosphere? Some will say our situation isn't that good but we've learned to appreciate the little things and those surrounding us. We have a nice bunch of friends to Party, cry, have fun and just chill around us and I have the most important person I can ask for.... my Sister whom I'll always be thankful for allowing me to live my dream and take it as her own. And since I don't want to cry and get all sentimental; this should be it for today. Wow, I can barely believe it's been almost 2 months since I said goodbye, to be quite honest; I've been blogging in my head for over 2 weeks, seems like every time I try to take a break from blogging, my brain explodes with Posts ideas lol. I'm coming back because I finally did something more interesting than going out with friends (although a Bday celebration post will be coming soon!). 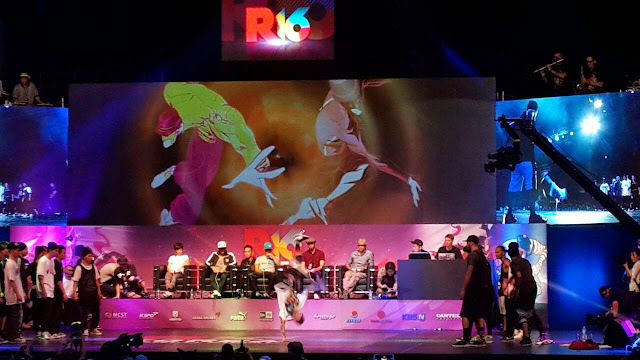 I was invited to the R16 Final Championship in Seoul, R16 Stands for Respect for the 16 countries that participate in it and is an annual international b-boy tournament and urban arts cultural festival sponsored mainly by the KTO and the South Korean Ministry of Culture, Sports and Tourism. The Festival was first held in 2007 in Seoul. The 2008 event took place in Suwon, 2009 was in Incheon. 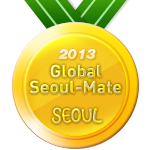 In 2010 it was brought back to Seoul. 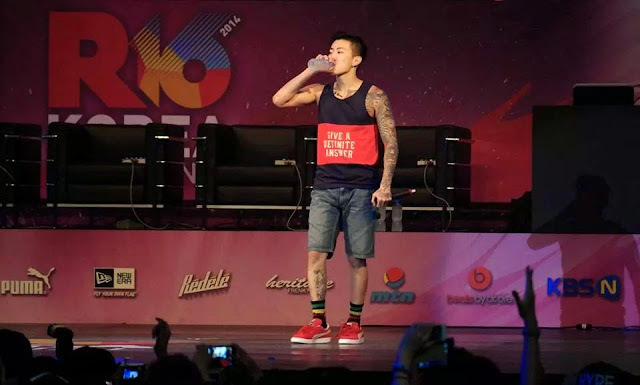 Korean-American b-boy, singer, rapper, Jay Park has been the Official Ambassador since 2011. 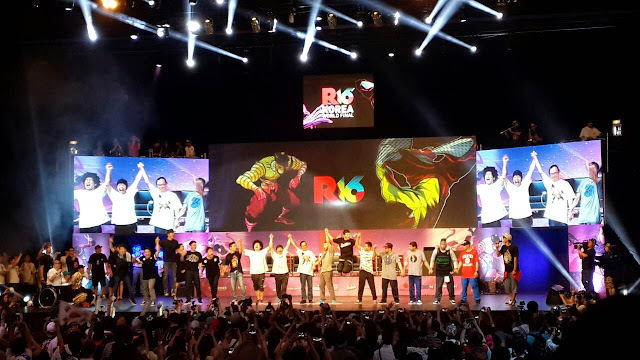 The event was held this weekend (July 5-6th), the 1st day was Solo competitions for Bboys, Popping and Locking while the 2nd day was the BBoys crew battle. To be honest, I don't like Popping nor Locking very much, ergo, it was a bit tedious after 4 hours of non-stop competitions. 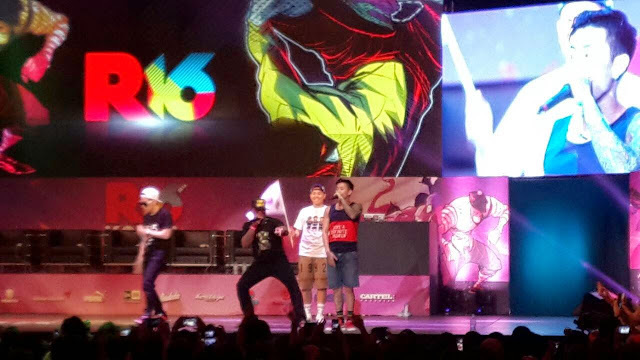 The 1st day was open with an AMAZING act of Beat box that pumped the audience and kept us going. My favorite competition was Locking because the 2 finals were a Husband and Wife from Japan, and I'm sorry dude, but your wife KILLED IT!, she was awesome and show him who's the boss (hehe). The 2nd day was Bboys Crews Showcase and Battle with a Performance by Jay Park, Loco and Gray (AOMG) that was then followed by an After party at one of the most exclusive clubs in Korea (Octagon in Gangnam). Being a Jay Park fan, I was very excited about it, and since I've written about bboys before, well, the battles got me all excited (lol). 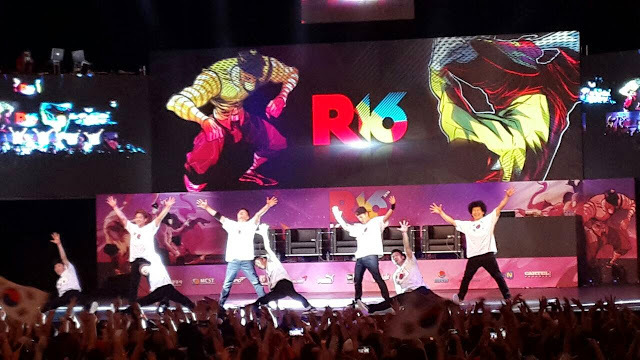 The showcase was Amazing, Russia, Taiwan, Korea and Japan (They used Jazz music...it was AWESOME!) were my favorites, but the Battle, Wow, they did a really great job. The final battle was Korea vs Russia, while Russia had my heart most of the time, I have to agree with the judges because Korea really stood up and got the 1st place. 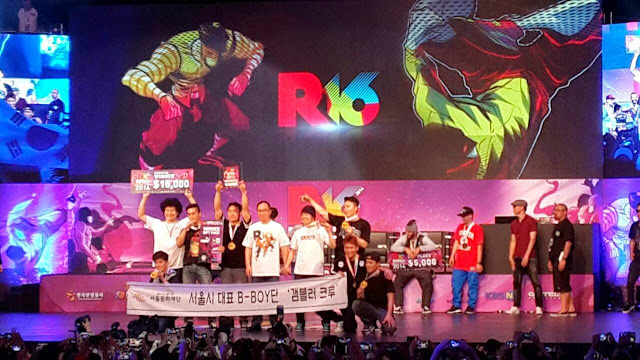 At the end, one of the members of Gamblerz Crew (Korea) gave a speech about how excited they were; they 1st won the R16 3 years ago but after, they had a bad time, no money or studio to practice and they had to endure a lot of things, this just makes you respect them even more, doesn't it? At 10 pm (show started at 6) the winners had been announced and it was time for AOMG's showcase, it was a short but good show, I enjoyed it and even though I feel extremely tired this monday (hehe), I can't say I didn't enjoy it, and I'm glad I had the opportunity to go. I would like to Thank the KTO and the K-Supporters for the tickets, hopefully this won't be the last time! 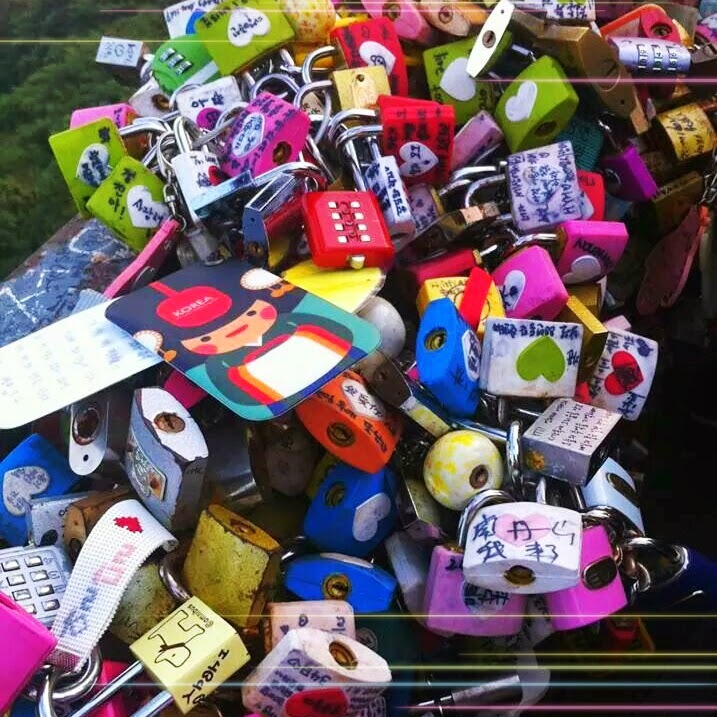 The "Double Trouble en Corea" vlog will take some more time as there's much editing to do hehe. I"ve taken blogging breaks before mostly because of a lack of inspiration but this time I'm just tired and I don't think updating random posts is good enough. I started this blog back in.2009, it's been a while isn't it?, it went from a cooking blog to a Korean promotion blog to a Everything Korea and lastly to a My experiences in Korea kind of blog; but I'm not sure this is being enjoyed. I know for sure some people is not happy because I stopped "promoting" Korea; at least the way they wanted me to, but living in Korea is a whole new experience than just coming for a Vacation, you get to experience the Bad and Ugly of the city and its habitants, I'm not saying I dislike Korea, somehow I ended up loving it more and therefore I started writing about my day to day. These days things are... weird?, hectic?, complicated?, yup, Complicated is the word... we (my sis and I) started Vlogging over 2 months ago, we mostly post random videos about our life in Korea and this has taken more time than what I thought it would take but we are enjoying it VERY very much, last weekend we had our 1st Google Hangout with our viewers and it was really fun, we talked to them for close to 2 hours and answered some random questions like: Our favorite color and number but still we had a great time sharing a bit more about Korea and our lives here. I still have lots to blog about but I'm just not inspired or in the mood to do it these days... Hopefully i'll be back sooner than I expect it but you just never know. Anyway, I'm still around on Twitter (@Gisela_Verdin) and over at "Double Trouble en Corea" on youtube. We are halfway of our long weekend... oh, I still remember last year in Chuseok when I said "Man!, next time we have a long holiday it.will be until May..." gosh, where is my time going? Yesterday was chores day and today since it was cloudy and rainy; it's been bed day, I've been sleeping and every time I napped, I dreamed about my mom ♡... actually after the 2nd time I forced myself to sleep again because I just miss her soo much. CANCER ETIQUETTE: What NOT to say to a Cancer Patient!